Well now, this is a fine CD. Over the years, Pollo Del Mar has continue to get better and better. Then along comes this CD which takes the ball and runs. A major step forward, displaying maturity in arranging, writing, and playing. One of the best releases this year. Great trad damped reverb rhythm guitar, a sad and beautiful melody line that does indeed sing the praises of "Annabelle Lee" while fluidly issuing haunted images. The ominous bass line adds an element of danger. This is a really strong track. Dedicated to one tug boat of a car, "Cutlass Supreme" floats down the highway with a semi nerve-shattering dissonance, a kind of something's not right with the world feel. There's a taste of seventies blacksploitation flick about the track as well. The howling feedback end with it's demented string bending makes you feel like they just gave you something, and you don't know what it is, but you're in for a bad trip. 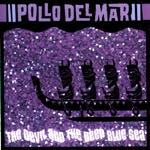 There just ain't no getting around the spectacular sound of Pollo Del Mar. Their twin guitar attack straddles dissonant discordant edge and pristine shimmering joy. This is totally tubular, happy and free of borders. The second half drops into a very cool hand clap rhythm and bass thing with much suavity. Way cool. With a funky sorta feel and a throbbing rhythm, "Jonny Foo: Ninja Chiropractor" is dramatic and pure Pollo Del Mar. The power and sophistication are very effective. Excellent use of feedback and sound. Just South of Half Moon Bay is a stretch of Highway One that is forever falling into the sea. This swimmingly cool tune is dedicated to that perennially failing roadbed. It sports very nifty howling feedback, chunky rhythms, strong lead work, tortured lines, and a dissonant edge that warns of a one way trip down the cliff to mother ocean. Now this is a pretty tune. "Consuela's Revenge" floats on an evening breeze across the North Bay with a sense of Spanish days and flowered nights. The trumpet in the middle is a nice touch. Thick whammy and ringing bell tones call for the natives to awaken to the alarm. Somewhat dangerous, somewhat beautiful, and definitely fluid. As it settle down in the middle to a sneaking ambush, "Moon Over Marin" just gets better and better. Hmmm. "The Saracen Gift" speaks with a funky bass and rhythmic percussion of a long road fraught with darkness and evil. Great imagery, and very powerful. This belongs in a film. This is really a priceless performance of "Little Drummer Boy." "Rt. 666" takes you rolling down a stormy highway on your way to uncertain doom and evil ways. Howling feedback and thundering bass... what a monster. A completely new treatment of Jerry Lordan's "Apache" is found here. What the Mermen did to "Hawaii Five-0," Pollo Del Mar do to Jorgen Ingmann's hit. The slowness adds to the fluidity of the song. Truly artful! The only other treatment on this level is Jon and the Nightriders'. Gorgeous!